This heavy duty arm and clamp set features two 1″ x 36″ stainless steel grooming arms, along with 2 heavy-duty, welded steel locking clamps for “No-Sit” on the biggest of dogs. If you regularly work with large dogs and are tired of the constant struggle to keep them standing, use this extra large set of arms and clamps. This arm and clamp set should only be ordered if you already own a Groomers Helper® Professional Set. This set does not include a Groomers Helper® Starter Set or Loop or the grooming table. A Non-standard table has a table top that is over 1 3/4″ thick – it may be home made, or a lighted grooming table, or a table that has a metal frame holding the top on. 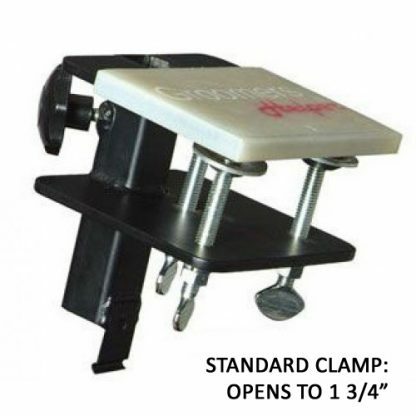 This clamp is designed for use with a non-standard grooming table ONLY and should not be used on a standard table top. This clamp will open to a maximum of 3 1/2″ and is designed to be used with a 1″ width, square grooming arm. If you have a 3/4″ arm please click here for the proper clamp. 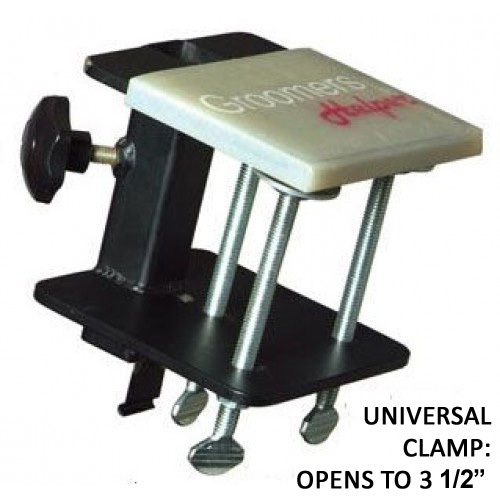 Do not purchase a Universal Clamp(s) if a Standard Clamp will work. The weakest parts of any clamp are the screw in bolts that hold it to the tabletop. Therefore if you are using a Universal Clamp with a 1″ thick table you will have over 2″ of the screw out of the clamp and pressing into the table. This will allow any stress from the arm to be loaded on to the screws and increase the likelihood of them bending. You shouldpurchase the 1″ Standard Clamp unless necessary. 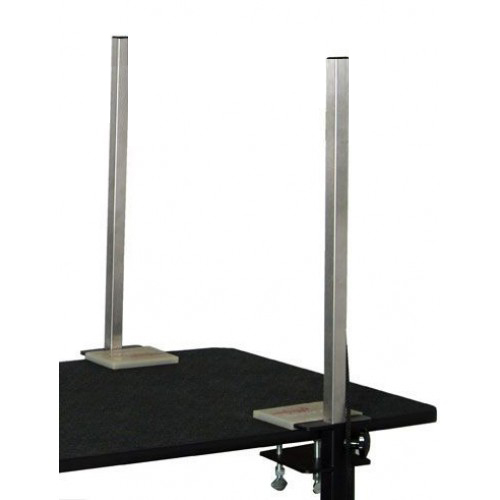 If you have purchased this Universal Clamp in order to get past the table frame, but the table top itself is only 1″ thick, we recommend adding additional support. One solution that is common is to cut a 2ʺ x 4ʺ (1.5” thick) the size of the clamp (6”) and place it between the table bottom and the cup washers on the top of the screws of the clamp. This will shorten the distance the screws go in and make it much harder for them to bend. Use a few drops of wood glue and this will keep the block in place. Standard: opens up to 1 3/4", Universal: opens up to 3 1/2"